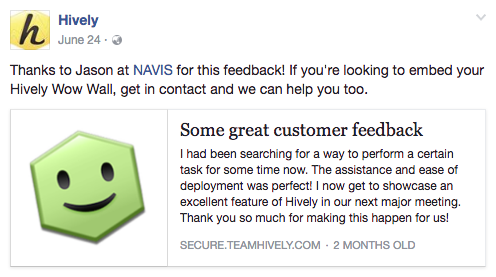 ﻿ Hively » Can I share my feedback on social sites? Can I share my feedback on social sites? Where permission has been given by the rater, you can share your feedback to Twitter and Facebook right from within Hively. This feature is particularly handy for ‘testimonial style’ feedback and is available for Wow and Happy ratings. For these rating types, raters are asked whether their feedback can be shared as a part of the rating process. So, when a rater gives their consent to share their feedback, Account Admins will now see Twitter and Facebook icons next to that rating on the All Ratings page in Hively. Click the icon and you’ll be prompted to share the rating to your Facebook company page or Twitter feed. As always, we’d love to hear your thoughts on this new feature, best of luck sharing just how much your customers love your company with the rest of the world!